It is a silvery white metal with a metallic luster, it is rarely seen as such on account of its high melting point, which is the 3rd highest after tungsten (3422 oC) & carbon (3550 oC). Rhenium is very hard, and it resists corrosion but slowly tarnishes in moist air, and the annealed rhenium is very ductile, and can be bent, rolled, or coiled. Reacts with fluorine, when heated, and forming a mixture of Rhenium (VI) fluoride & rhenium (VII) fluoride. But at 400 oC & under pressure, only rhenium (VII) fluoride is formed. The metal can dissolve in warm Bromine water. The metal doesn’t dissolve in hydrochloric acid (HCl) & hydrofluoric acid (HF), but dissolve in nitric acid (HNO3) & concentrated sulphuric acid (H2SO4), and forming a solution of perrhenic acid (HReO4). 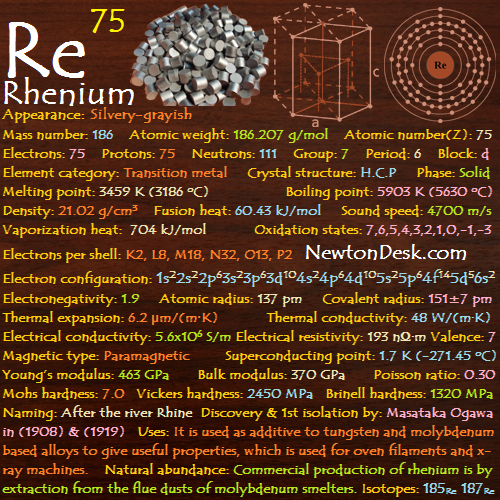 Rhenium is used as an additive to molybdenum and tungsten based alloys to give useful properties, where these alloys are used for X-ray machines(In rotating anode X-ray tube) & oven filaments. It is also used as an electrical contact material, because of good wear and corrosion resistant property. Molybdenum- Rhenium alloys are superconductive at 10 K (-263.15 oC). Tungsten-Rhenium alloy are used to make Thermocouples for measuring temperatures up to 2200 oC, and used as a rhenium wire in photoflash lamps for photography. It is an excellent catalyst for isomerization and hydrogenation. platinum–rhenium alloy is used as catalysts for catalytic reforming (chemical process for making lead-free, high-octane gasoline). Rhenium catalysts are extremely resistant to chemical poisoning (deactivation) from sulfur, nitrogen, & phosphorus, and so are used in certain kind of hydrogenation reactions for fine chemicals. Rhenium is also added in nickel based superalloys for improved creep strength, which is used to make single-crystal turbine blades. Very little is known about its toxicity because it is used in very small amounts, but but two alloys potassium perrhenate (KO4Re) & rhenium trichloride (ReCl3) could have acute toxicity, and it should be handled with care until more data becomes available. 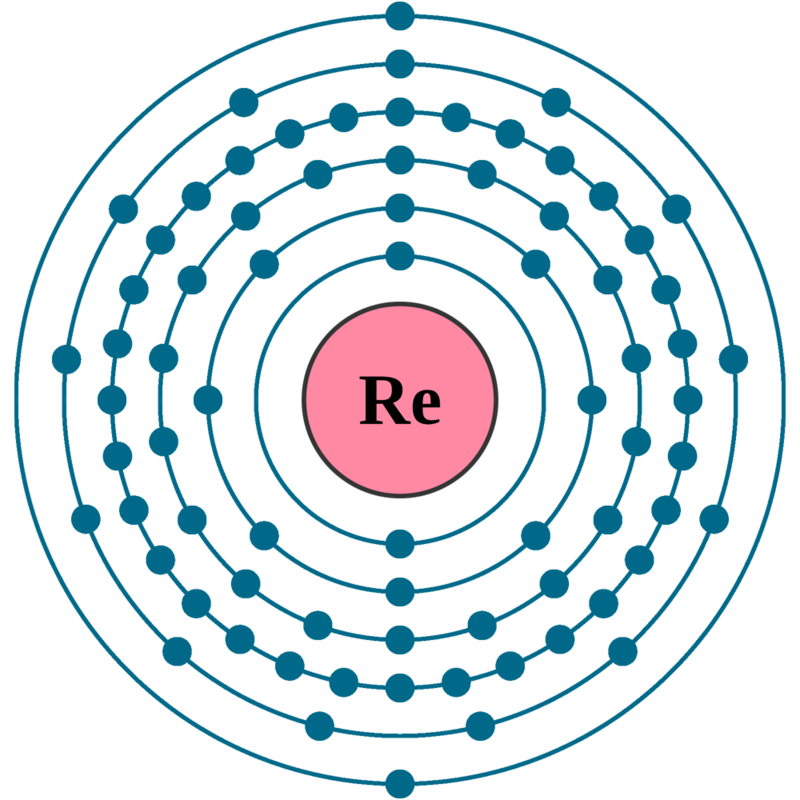 Rhenium one of the rarest metal on Earth, where It does not occur uncombined in nature or as a compound in a distinct mineral species, however, it is widely spread throughout the earth’s crust to the extent of about 0.001 ppm (parts per million). 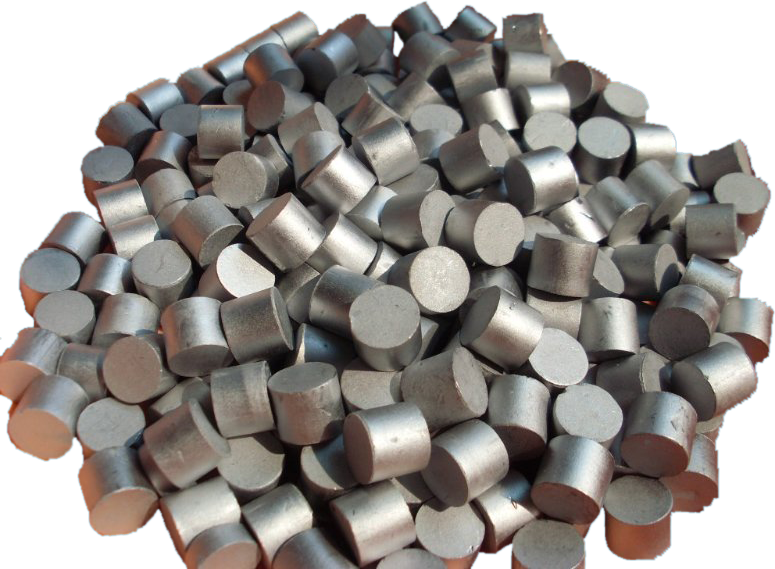 Commercially, rhenium is produced by extraction from the flue dust of molybdenum smelters (a process of applying heat to ore in order to extract out a base metal), which is obtained from copper-sulfide (Cu2S) ores. Rhenium metal is prepared by reducing ammonium perrhentate (NH4ReO4) with hydrogen at elevated temperatures. 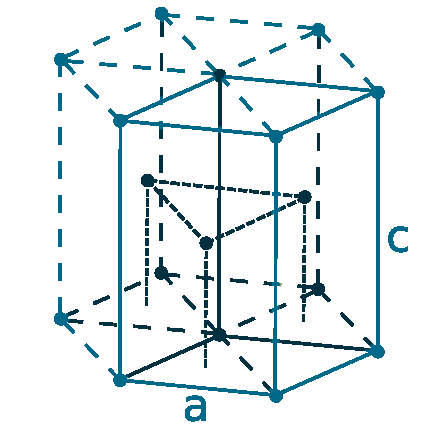 Commercial form of the element is usually powder, but it can be consolidated (combine into a single) by pressing and resistance-sintering in a vacuum or hydrogen atmosphere. 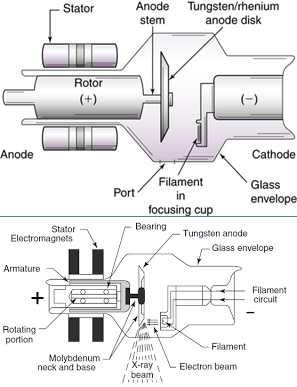 This process produces a compact shape in excess of 90% of the density of the metal. Annual world wide production is around 50-60 tons.